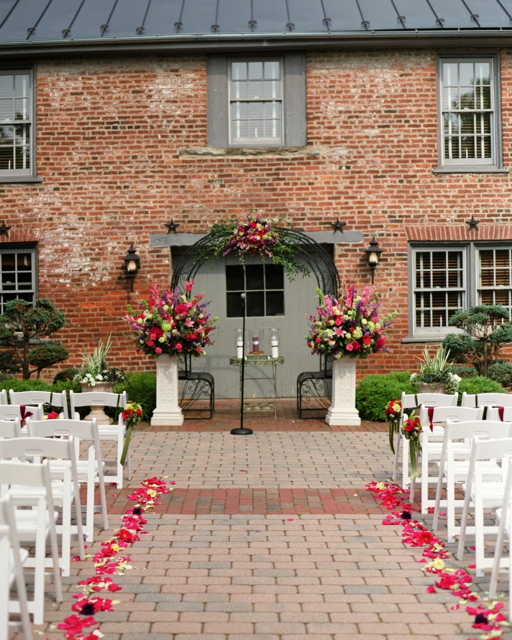 The ceremony decor often ranges from full and lush, to very simple. 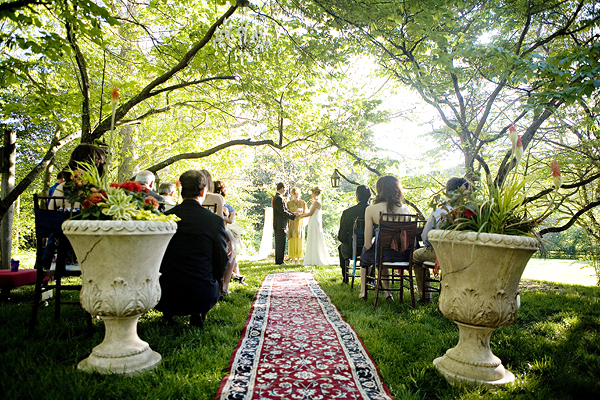 The ceremony decor will be dictated by style, religion, and budget of the bride and groom. Consider re-purposing florals from the ceremony area for your reception, and remember if budget does not allow for over the top florals and decor, this area can be all about the couple and the significance of the day. 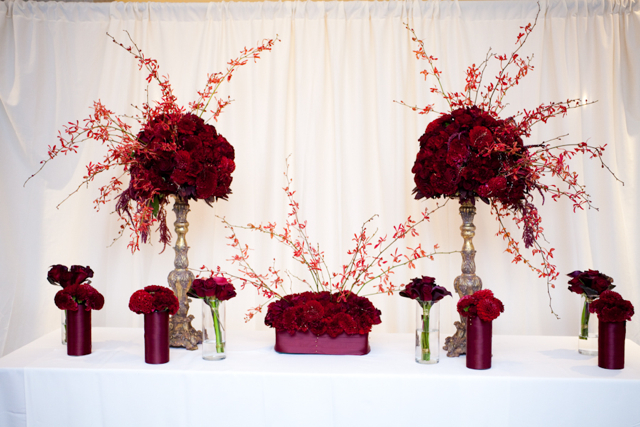 These lovely centerpieces of red orchids, red roses, and red carnations, were created for the reception but they were used first for the cereomony. The look was stunning. Photography by Genevieve Leiper. Wine barrels were used to frame the bride and groom and hold the altar flowers. This was perfect for this vineyard wedding. Photography by Anne Robert. This wedding was featured on Style Me Prety. Large arrangements were placed at the back of the aisle. These designs were moved inside to the reception after the ceremony. Photography by Kate Headley. A huge mound of baby blue hydrangea was used to create this lovely altar design. Photography by Martha FitzSimon. Huge outdoor planters and a long oriental rug completely turned this aisle into magic. Photography by Kristen Gardener. 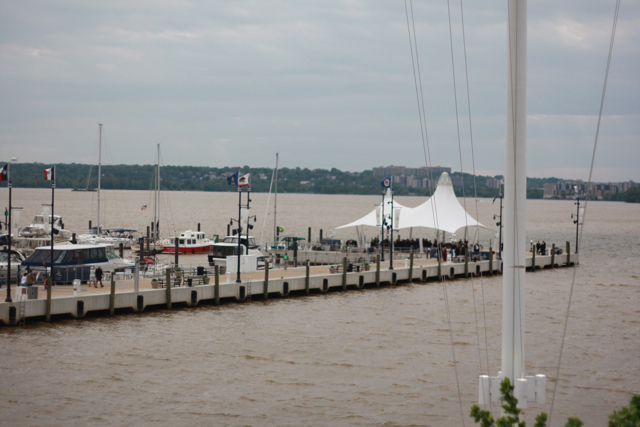 This wedding took place on the pier at the National Harbour. 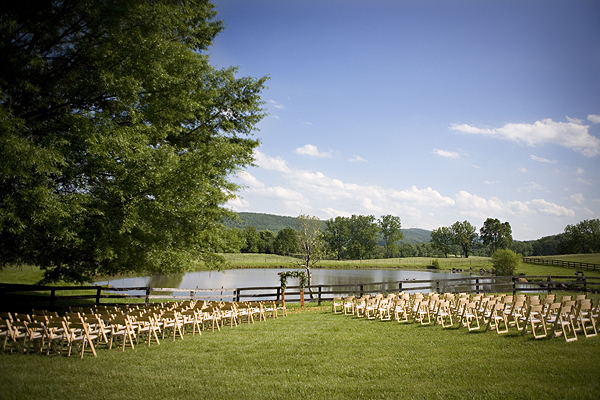 No ceremony decor was needed with a view like this. A garland of flowers was draped over this unity candle. Photography by Ron Jones. 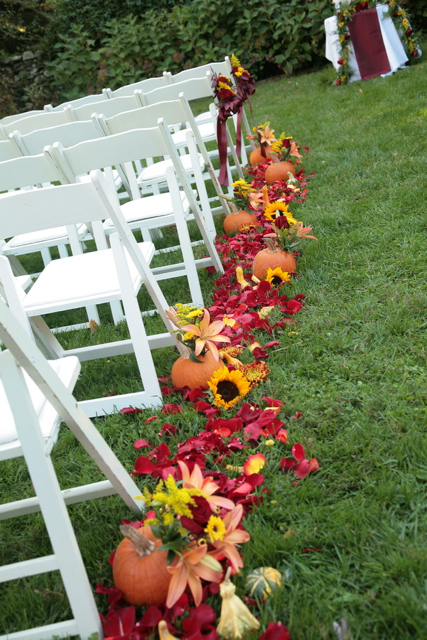 Pumpkins were hollowed out and used as vases to decorate the aisle. Mini pumpkins and gourds were scattered amongst the petals. Photography by Ron Jones. Simple bows of pee gee hydrangea and white roses were used to mark family reserved seating. Photography by Martha FitzSimons. 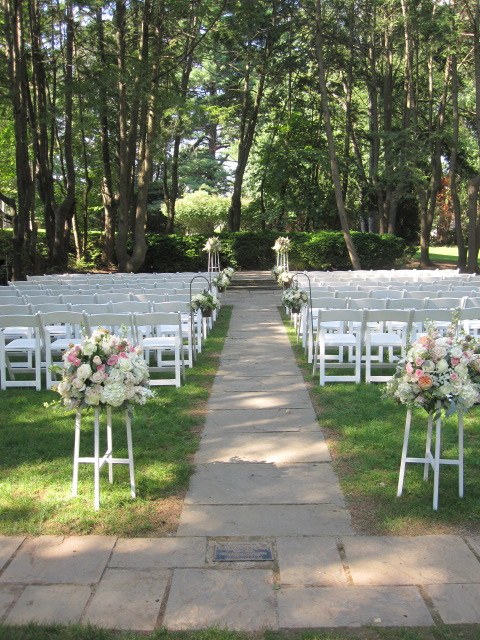 This ceremony and aisle were decorated with paper flowers. Photography by Love, Life, Images. Lanterns hung from the trees. Photography by Kristen Gardner. 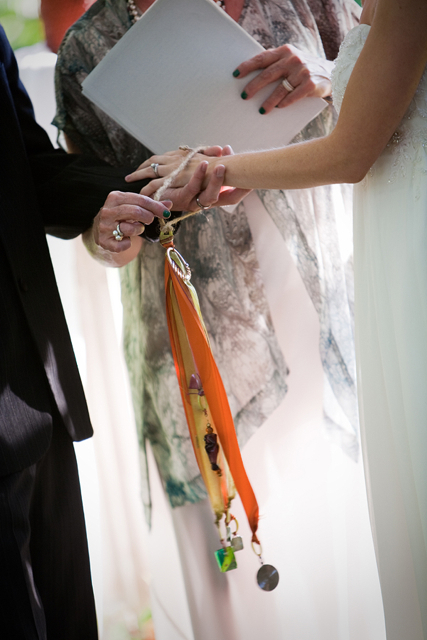 A knot tying ceremony. Photography by Kristen Gardener. Simple designs can be added to the unity candle or memory candles, to give this space a pop of color. A simple arch was created and placed near the water for a fabulous view. Photography Love, Life, Images. 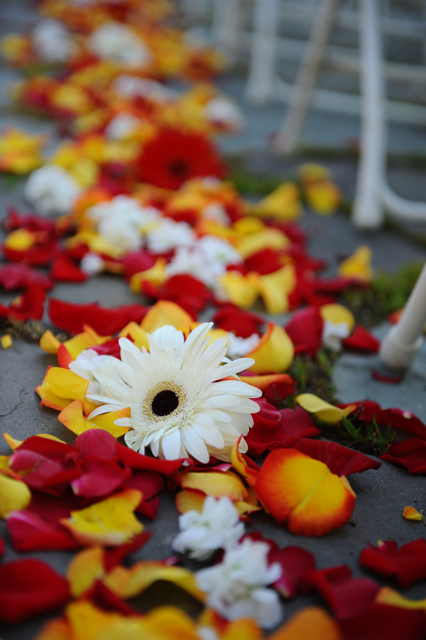 Piles of white petals were used to decorate this ceremony area. Photography Jessica Patterson. Large pomanders of white carnations hung from shepherds hooks down the aisle. Photography by Jessica Patterson. 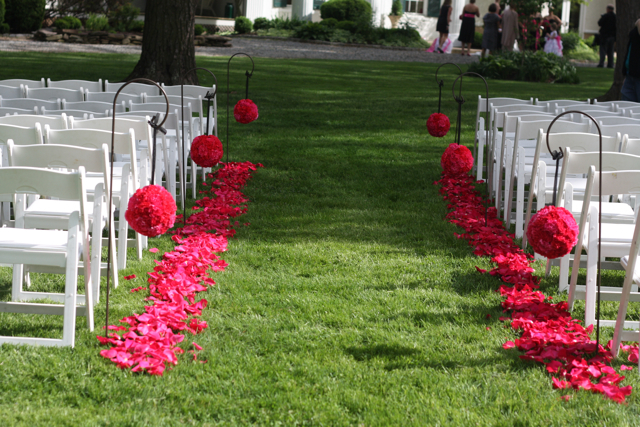 Hot pink petals and pink carnation pomanders decorated the aisle for this wedding. Photography by Bob Updegrove. 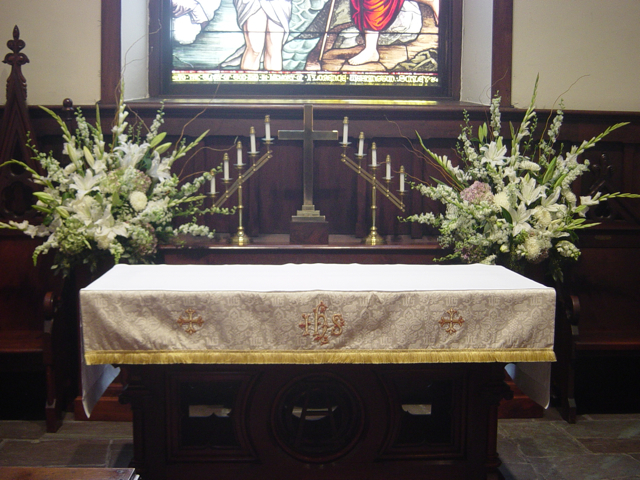 White flowering branches with white callas were used to decorate this altar. Centerpieces were used to decorate the altar. 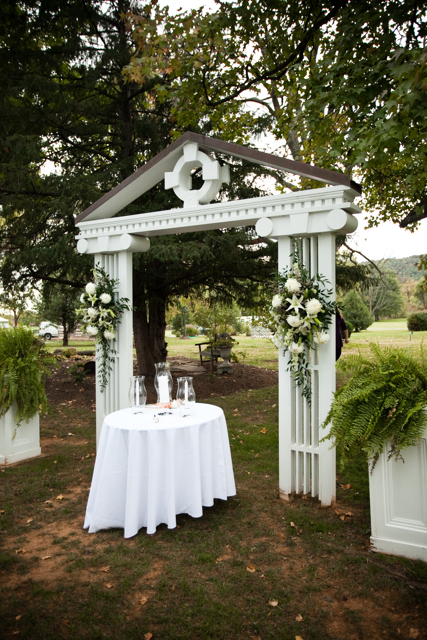 We used a mix of the high and low designs to create this ceremony space. The designs were moved to the guest tables after the wedding. Photography by Collins Metu. Mini bouquets were wired onto chairs to mark family reserved seating. 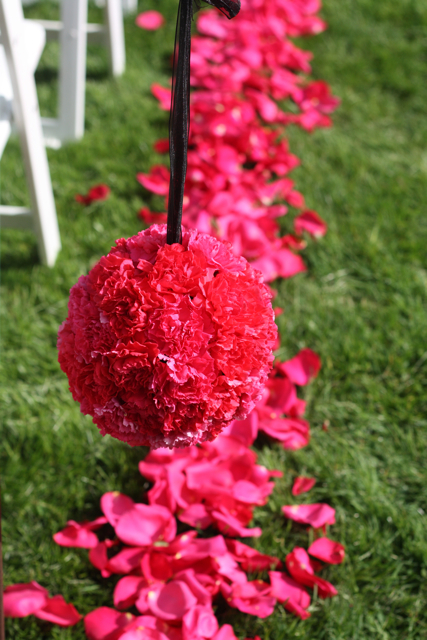 Hot pink pomanders to decorate the aisle. Photography Bob Updegrove. Pomanders on shepherds hook defined this aisle with lots of hot pink petals. Photography by Bob Updegrove. 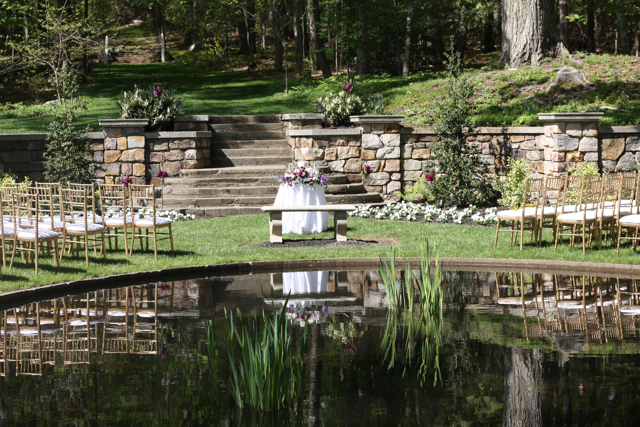 This ceremony was designed around a lovely reflecting pool. 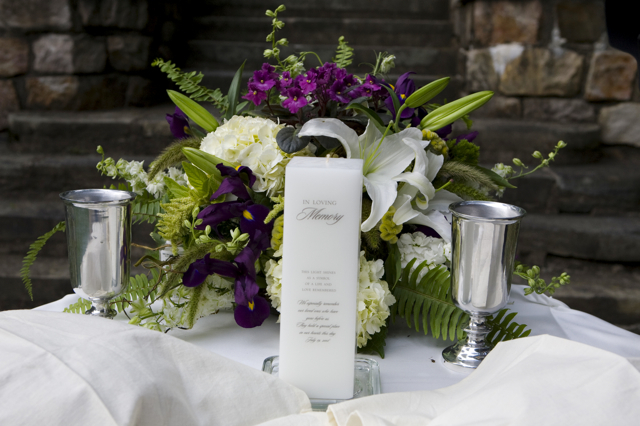 This arrangement was designed to enhance the unity candle. 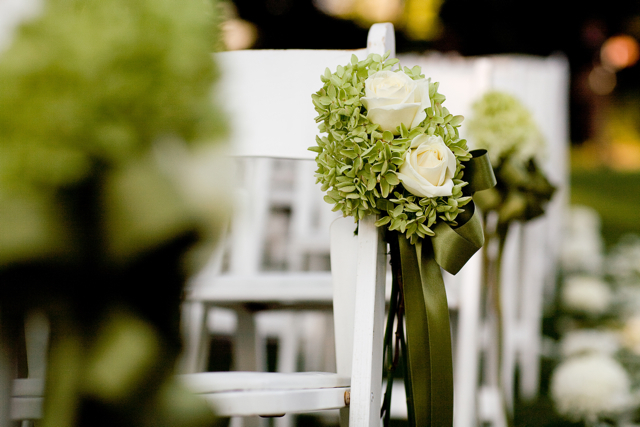 Clusters of flowers were tied to the chairs to mark family reserved seating. 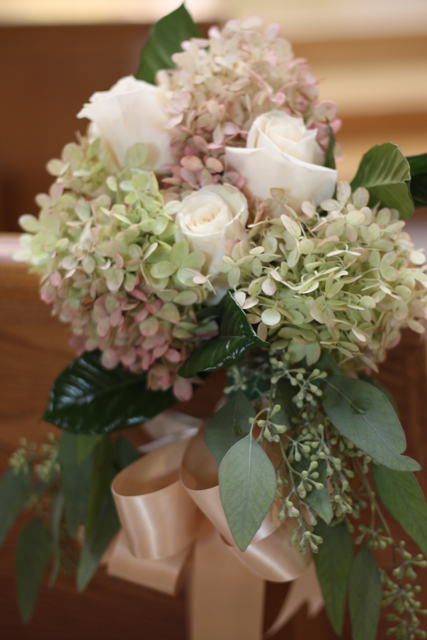 Pee gee hydrangea, seeded euc and roses lined the aisle of the church. 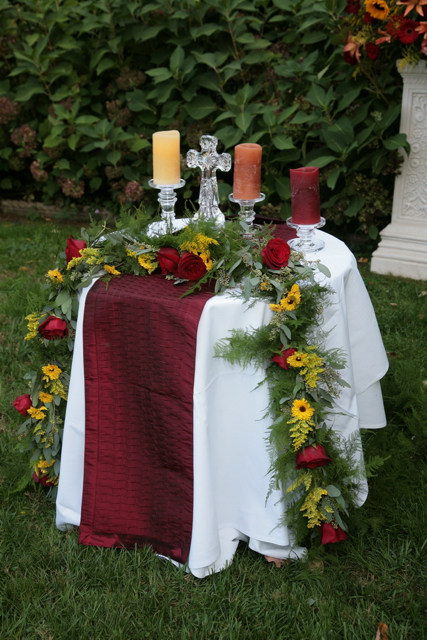 Large altar flowers can be placed on columns or on the floor in front of the altar. 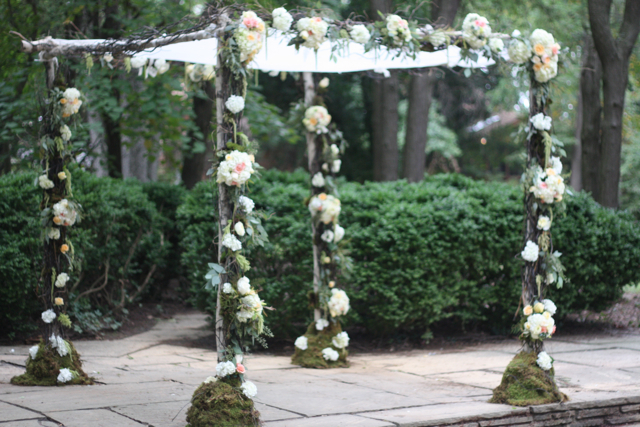 Our Chuppah created of birch, willow, moss, and flowers. Photography by Kate Headley. 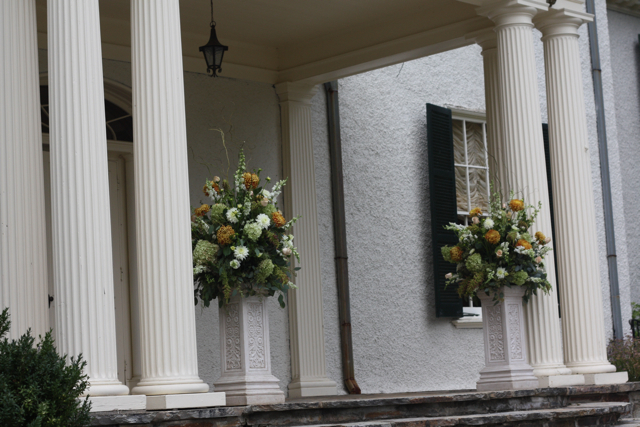 Large arrangements on columns for the ceremony. 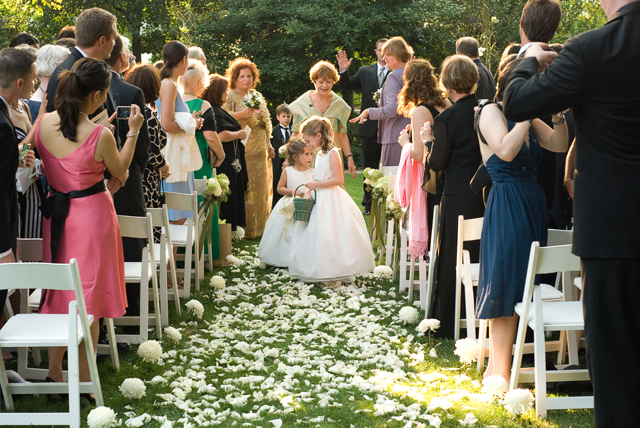 Petals down the aisle with inserted blossoms. Photography by Regeti’s. 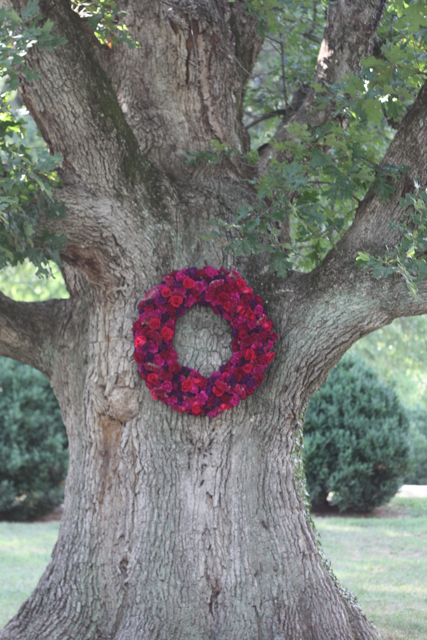 A large wreath of carnations and roses was used to create this ceremony space. Shepherds hooks line the aisle to the chuppah. Our birch and willow chuppah covered in white dendrobium orchids. Photography by Justine Ungaro. Mason jars and twine hung on shepherds hooks to decorate the aisle. 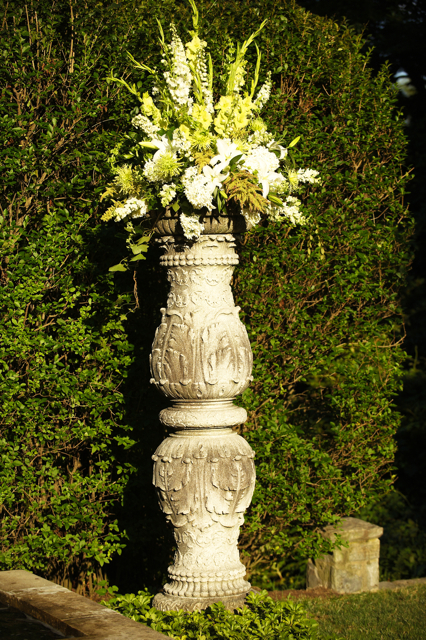 The brides father created this planter and green grass. We were asked to decorate the space with moss balls, and willow. A chuppah of willow and birch with red dahlias and purple orchids. Photography by Abby Jiu. Large altar design of white lily, white larkspur, white snapdragons, white delphinium, green glads, green mums and green hanging amaranthus. Pee gee hydrangea, white glads, white larkspur, white roses, white stock, white mums and spray roses were used to create these altar designs. 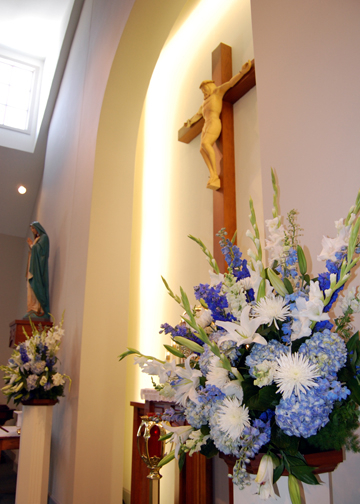 Blue hydrangea, blue delphinium, white spider mums, white lily, and white glads were used at the altar of this church. 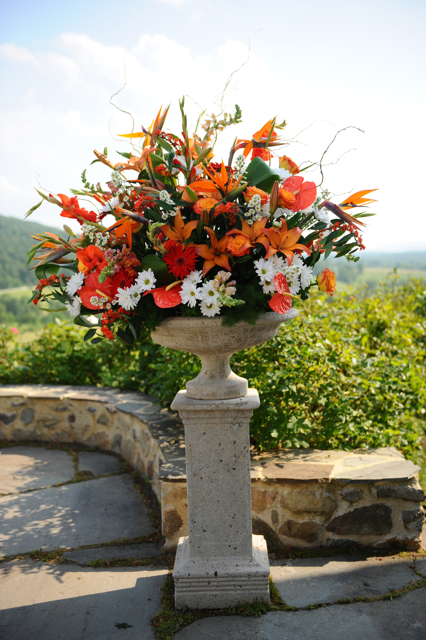 Elevated design of birds of paradise, red glads, orange lily, white daisy, white asters, red anthurium, red gerbers and red euphorbia were used to decorate this ceremony site. Photography by Jennifer Anderson. Petals line the aisle and full flower heads of stock and gerbers were added to the mass of petals. Photography by Jennifer Anderson. Large designs were created with sweeping willow. 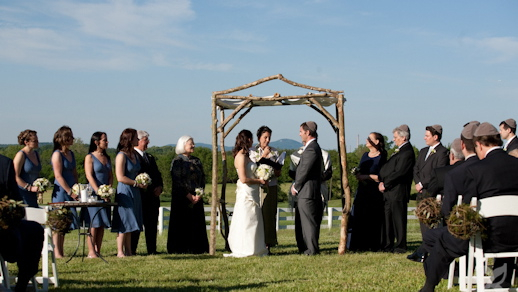 The willow was joined in the center to create an arch. 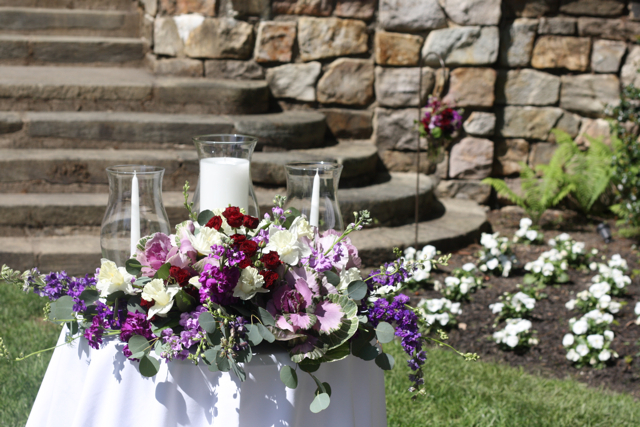 We used hydrangea, snapdragon, roses, larkspur, lily, fillers, and of course willow to create this design. 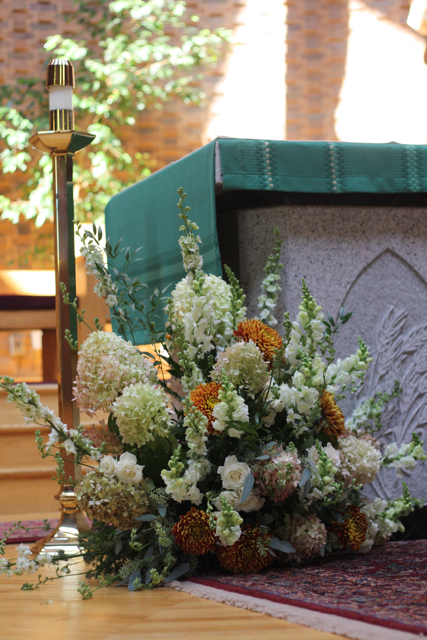 Large designs of pink roses, pink lily, pink gerbers, glads, green spiders, green viburnum, green bells of ireland, and purple stock and purple larkspur were used to create these altar pieces. This structure was created by the brides father. Photography by Three Lights Photo. 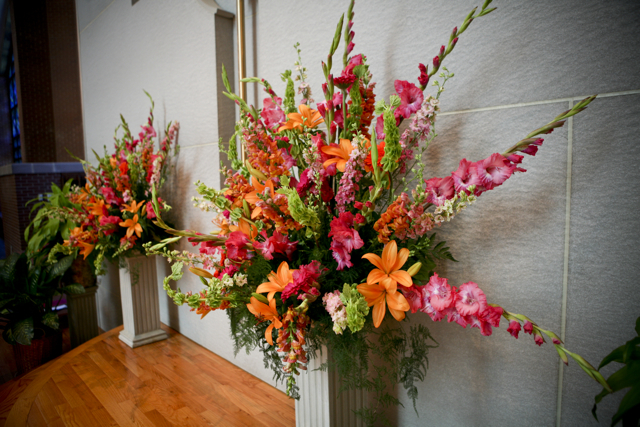 Orange snapdragons, orange lily, hot pink gerbers, hot pink glads, bells of ireland, pink larkspur and greens were used to create these bright and happy designs. This aisle was designed by placing white rose petals down the aisle and using white football mums inserted into the ground to define the aisle. Photography by Martha FitzSimons. Large arrangements were placed on crates and surrounded by ferns. 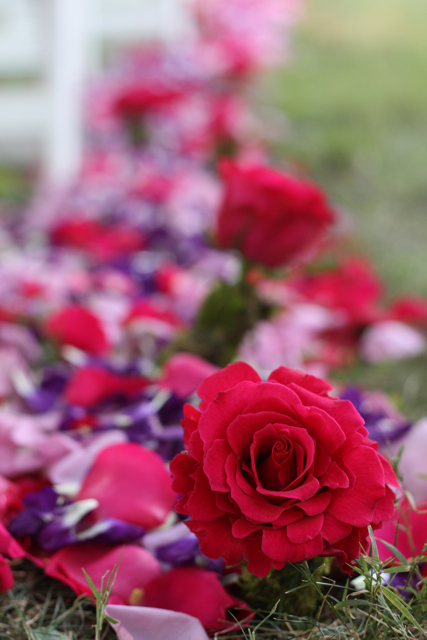 The bride requested that the flowers look as if they were coming up out of the ground. 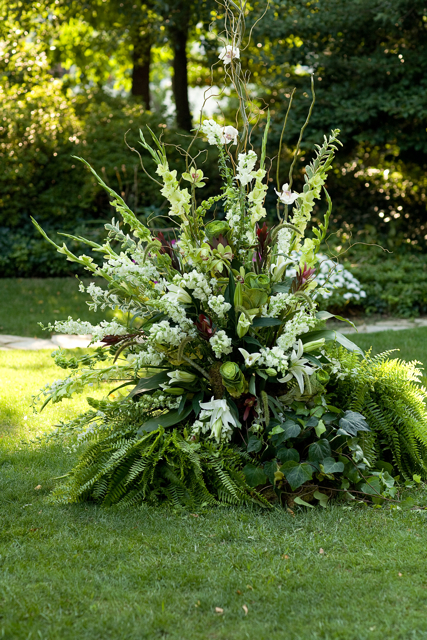 We used willow, hydrangea, snapdragons, larkpsur, lily, bells of ireland, glads, and greens to create these designs. Photography by Martha FitzSimons. Flowers were arranged in flat oasis cages and then mounted onto the ceremony structure. 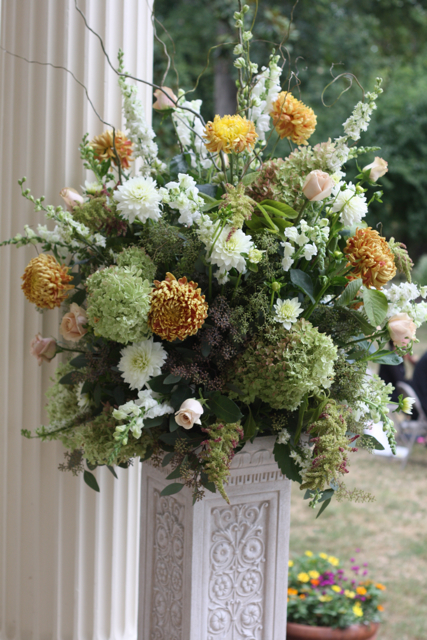 We used white lily, white larkspur, white football mums, snapdragons, and greens. Photography by Paul Morse. 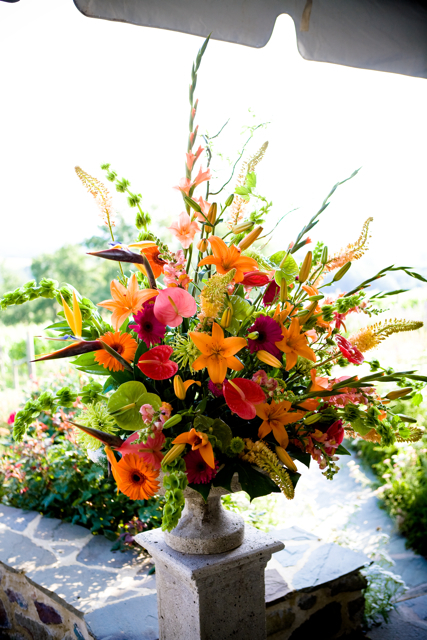 Green anthurium, birds of paradise, eremurus, orange lily, glads, bells of ireland, green spider mums, and gerber daises were used to create this design. These large altar arrangements were later used as buffet pieces. 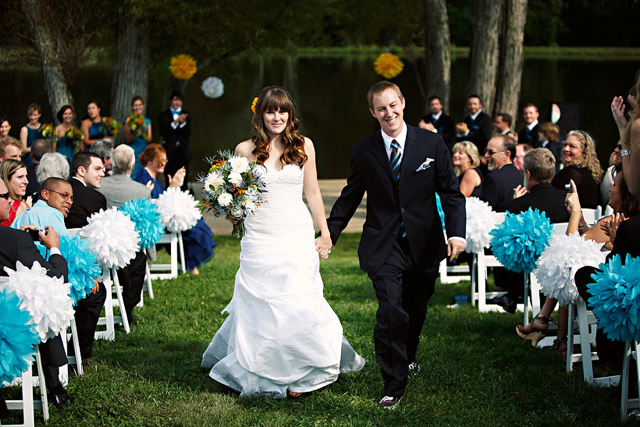 The petals down the aisle brought a bright happy touch all the way down the aisle. 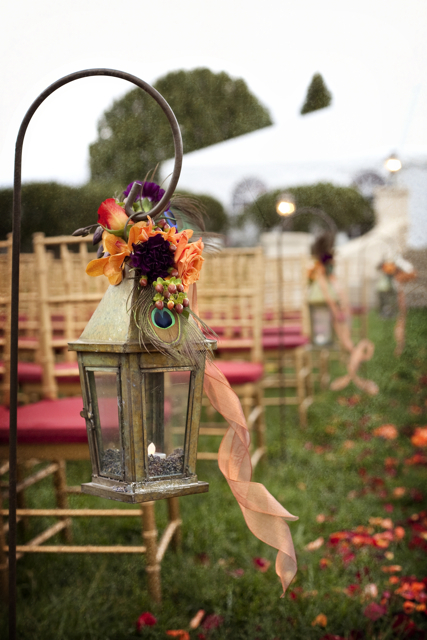 Shepherds hooks with lanterns is a lovely look for the aisle. Photography by Laura Ashbrook.